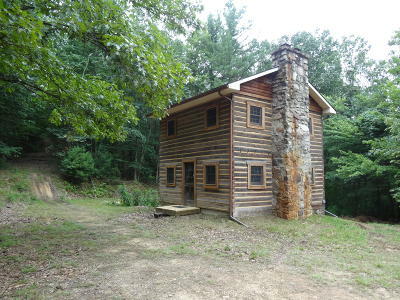 Second Creek- 84+/- acres with unique 2 story 1BR, 1BA log cabin over basement offers, a large living room with beautiful rock fireplace and wood burning inset, large BR and full bath. A second cabin overlooks a stocked pond and features 2BR, 2BA and an unfinished basement with fireplace. Both homes offer propane forced air and wood heat. Very private and secluded. Lots of wildlife.